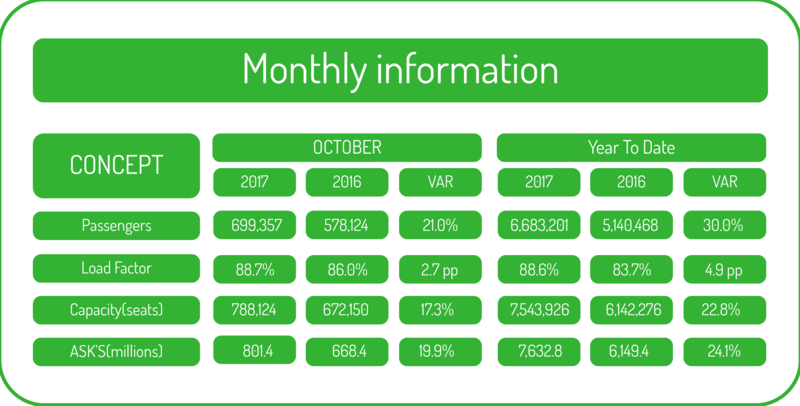 In October 2017, the traffic of Viva Autobus grew by 21%, compared to the same month of the previous year, to nearly 700 thousand customers and with a load factor of 89%. Viva Aerobus also increased its capacity, measured in available seats, by 17% compared to the same month of 2016. So far in 2017, the traffic of Viva Aerobus increased by 30%, compared to the pe-riod January-October 2016, to more than 6.6 million passengers. The accumulated load factor between January and October 2017 reached 89%, a growth of 4.9 percentage points compared to the same period of the previous year. Viva Aerobus is Mexico's low-cost airline. It started operations in 2006 and today operates the Viva Aerobus is Mexico's low-cost airline. It started operations in 2006 and today operates the youngest Latin American fleet with 22 Airbus A320, including two A320neo on 87 routes and 37 different desti-nations. With a clear vision to give all people the opportunity to fly, Viva Aerobus has democratized the airline industry with the lowest rates in México and the lowest costs in Latin America, making their flights the best value offer.